Daniel W. Halby, D.O. completed his undergraduate studies June 1971 with a B.S. in Microbiology and a minor in Chemistry at the prestigious California State University at Long Beach. He then went on to earn his medical degree June 1974 from the renowned University of Osteopathic Medicine and Health Sciences in Des Moines, Iowa. After finishing his internship (rotating) July 1975 at Interboro General Hospital, Brooklyn, New York, Dr. Halby had his own Family Practice in Winterset, Iowa for a short time. Dr. Halby relocated, started and owned his own Family Practice in Las Vegas, Nevada for 26 years. On March 24, 1992 Dr. Halby was certified in Family Practice by the American Osteopathic Board of Family Physicians. In early 2005 Dr. Halby found out that he had a natural aptitude and eye for aesthetic surgery; he had a passion for the study of hair. Growing up in a family that experienced severe hair loss in both the men and women, he found himself drawn to hair medicine and surgery, and discovered the major change it could have on one’s appearance and self-confidence. Techniques and equipment have rapidly evolved and changed over the last few years at a dizzying pace. The doctor takes pride in the fact that he updates himself on these changes every 3-4 months, taking time out from his busy full time hair practice to travel extensively, visiting clinics, workshops, seminars, and ISHRS conferences; training with the most respected state-of-the-art surgeons nationally and internationally. At this clinic the patient is given much more time with the doctor than 99.9% of all other clinics. The transplant patient is viewed as a very important patient, rather than a client. We are not a high patient volume office; no assembly lines. The patient consultation (1st visit), follow-up after surgery (3rd visit), and removal-of-stitches (4th visit) are always provided by the physician (Dr. Halby) who did the surgery, not a sales associate or a nurse. The doctor spends as much time as needed to assess the patient’s hair problem and explain the treatment options. The doctor prides himself on being very involved with all aspects of a patient’s treatment and surgery. 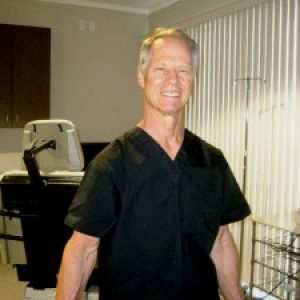 Dr. Halby performs only one surgery per day and does only one surgery at a time; therefore all of his attention is devoted to doing a high quality job. He is not like many surgeons who perform 2 or 3 surgeries at the same time; therefore they are side tracked into doing a poor job. The doctor performs all the surgery himself: design the hairline, remove and suture the donor strip, and make the recipient hair graft sites. He utilizes experienced hair transplant technicians, who assist with surgery, cut and sliver the graphs under a microscope, and help the doctor place the graphs. 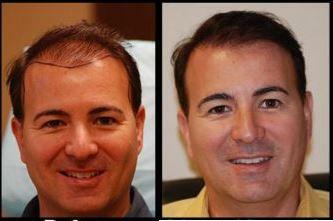 "An excellent example of a frontal hair restoration. Note how much younger the patient looks with his face properly framed. " 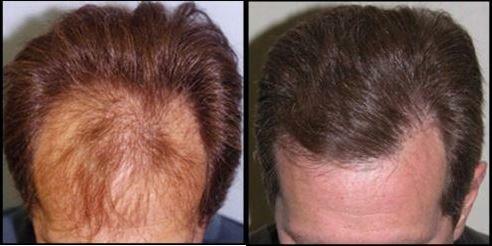 "A good example of a proper hairline procedure performed on a young patient. This hairline will mature well and look appropriate as the patient continues to age. "